In the wake of last week’s election, 57% of Americans say that – all in all – they are happy with the results; 41% say they are unhappy. This is similar to the 59% majority who say they are happy the Democratic Party won control of the House of Representatives (38% say they are unhappy). 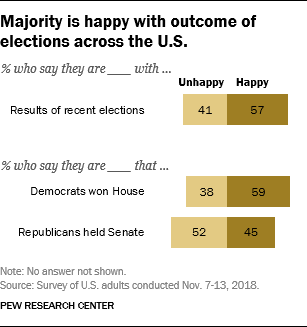 But when it comes to the GOP maintaining control of the Senate, somewhat more say they are unhappy than happy (52% vs. 45%). There is only a modest partisan gap in overall reactions to the outcome of the election: 60% of Democrats and 55% of Republicans say they are happy with the overall outcome. But conservative Republicans offer somewhat less positive overall evaluations of the election than other partisan and ideological groups: 51% are happy, while a similar share (48%) are unhappy. 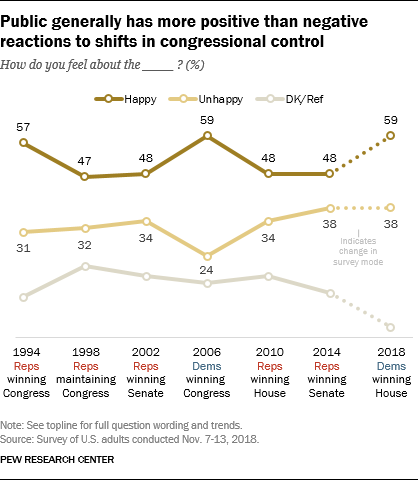 In evaluations of midterms since 1994, the public has generally been more happy than unhappy about a change of power in a congressional chamber. This pattern holds true for the 2018 election. As in the past, an overwhelming majority of those who back the party that has regained control of a chamber express happiness about this: 91% of Democrats and Democratic leaners say they are happy about their party winning the House. About three-quarters of Republicans and Republican leaners (77%) are unhappy about this change. Conversely, while 87% of Republicans and Republican leaners are happy the GOP maintained control of the Senate, almost the same share of Democrats (86%) are unhappy about this. Overall, 40% of Americans say they are relieved about the Democratic Party gaining control of the House; slightly fewer 34% say they are disappointed. And while about two-in-ten (19%) say they are excited, just 5% say they are angry about this outcome. Most Republicans and Republican leaners (72%) say they are disappointed about Democrats gaining control of the House, while just 11% say they are angry; 11% say they are relieved about this outcome (4% are excited). 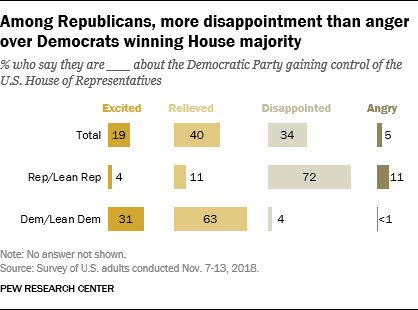 A 63% majority of Democrats and Democratic leaners say they are relieved by their party’s victory in congressional races; about a third (31%) express excitement that their party is back in the majority in the House. And few Democrats say they are disappointed (4%) or angry (less than 1%) about this development. These reactions are very similar to how Republicans and Democrats expected to feel about this outcome before the election. For instance, in October, 61% of Democrats said they would be relieved if the Democratic Party regained control of the House and 68% of Republicans said they would be disappointed if this happened. 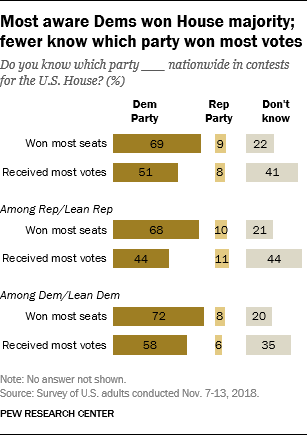 About seven-in-ten Americans (69%) know that the Democratic Party won the most seats nationwide in this month’s elections for the House of Representatives, while 22% say they don’t know which party won more seats. There is far less certainty about which party won the most votes nationwide for the House: About four-in-ten (41%) say they do not know, while about half (51%) know more votes for Congress were cast for Democratic candidates than for Republican candidates. Republicans (68%) and Democrats (72%) are about equally likely to know who will control the House in January, while Democrats (58%) are more likely than Republicans to know Democratic candidates received more votes nationwide (44%). About six-in-ten (59%) say there was more discussion of issues this campaign compared to past elections. 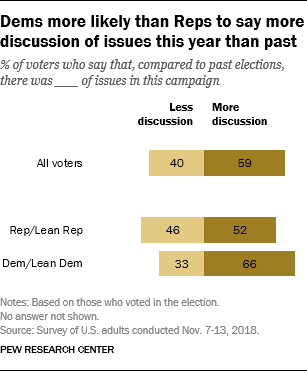 Four-in-ten (40%) say there was less discussion of issues this year than in the past. Democrats are more likely than Republicans to say the campaign was more substantive than in the past: Roughly two-thirds of Democrats and Democratic-leaning independents (66%) say there was more discussion of issues; just 33% say there was less. Republicans and Republican-leaning independents are more divided in their evaluations: 52% say there was more focus on issues than in the past, 46% say less. Little Partisan Agreement on the Pressing Problems Facing the U.S.